Pre-Season Sale - Use code "SPRING15" for orders $1600+ and "SPRING10" on orders up to $1,599. Ends 4/30! 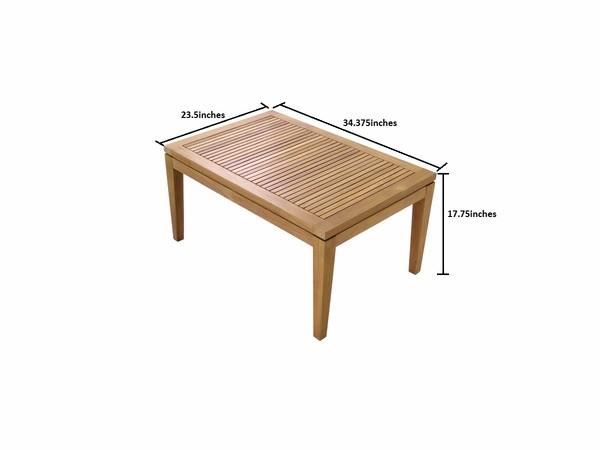 Handcrafted with premium Grade A teak hardwood, Oloa Teak Collection offers long lasting comfort. Known for their strength and durability, teak furniture weathers elements year after year, developing a beautiful silver grey patina if left untreated. 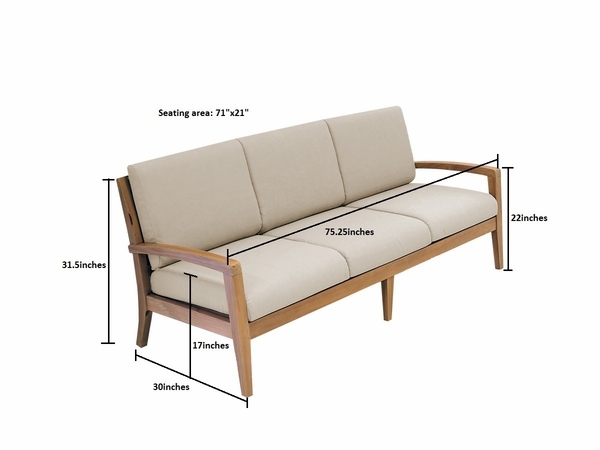 Angular seating with tapered legs and fully concealed hardware keeps lines simple and clean for modern classic profile. Combine warmth of wood with comfortable cushions covered in all-weather fabric and you can experience indoor comfort in a sophisticated outdoor seating set. 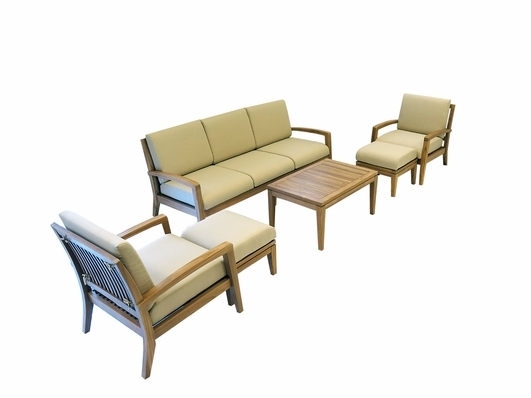 Enjoy�Oloa Teak Collection at the center of your outdoor gatherings for years to come. Set includes 1 sofa + 2 club chairs + 2 ottomans + coffee table. 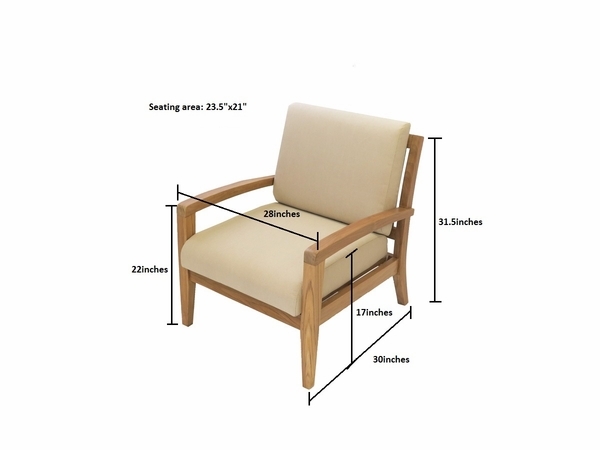 No assembly on chairs; easy assembly on table and ottoman; hardware included. We offer free shipping on order above $199. Orders are shipped within indicated lead time of receiving cleared payment. We are not responsible for shipping delays that are a result of credit card/billing problems, product availability delays, or order changes made after the order has been placed. When order is shipped, shipment confirmation email will be sent. Carrier will call to set up a delivery appointment. Curbside Delivery: Driver will offload your item to the curb at the end of your driveway for curbside delivery. Signature is required. White Glove Delivery: Driver will place your item inside your home or designated spot and remove packaging from the premise (read details). Please contact us for a quote. We only ship to addresses within the contiguous 48 states of the US. If you live outside United States (i.e. Canada, Alaska or Hawaii), but have a stateside address, we can ship your order there. We ship to the address on order. Please provide working daytime phone number for the freight company to make delivery appointment with you. Should any delay occur due to incorrect contact information, customer will be responsible for the incurred storage fee. Extraordinary delivery requirements (ex: flight of stairs) may necessitate an additional fee from the carrier. Ohana is the Hawaiian term for "Family". It is our guiding principle in how we view treat our customers. Ohana Depot is the exclusive owner of the branded trade name and trademark of the Ohana Collection, and its product lines. We offer the best value for your dollar, price guaranteed. Join the 90,000+ Ohana customers who have taken advantage of great savings. © Copyright Ohana Depot, Inc. All Rights Reserved.